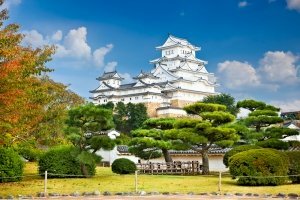 Castles are among the most visited attractions in Japan. There are hundreds of them all over the country, with many of the ancient structures having undergone restoration and renovation through the years, following severe damage from various wars, fires and other calamities. 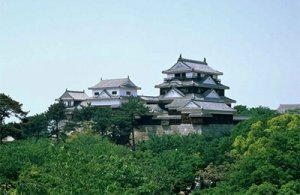 The construction of castles in Japan started as early as the 7th century, when they were built for defensive purposes. They served as fortresses where lords, rulers and noble families could live safely when beset by invaders and rival clans. In the 1400s and 1500s, the rise in the number of castle towns happened quickly, as wars spread across the country. The feudal lords ordered the building of larger fortifications and hired samurai warriors to protect them against their enemies. During the Meiji Restoration period, several of these castles were intentionally destroyed by local people wishing to expunge the reminder of the terrors of feudalism, while others were damaged due to wars. In the past decades, many of them have been reconstructed and are now open to the public as museums. Tenshukaku – The main castle tower or castle keep. It can be three, five, seven, or more storeys high. It served as the official command headquarters and residence of the daimyo. Goten – Also called the palace, it housed the offices of the daimyo’s staff and subordinates. In some cases, it was also used as the official residence of the daimyo. Yagura – These guard towers are found at wall corners and have clear views of the surroundings. In addition to being watchtowers, they were also used as astronomy towers and water towers. Stone walls – Castle fortresses are surrounded by thick stone walls as effective defensive measures. Moat – A key feature in any fortification as it provided an additional obstacle to enemies and attackers. They were made by rerouting streams from the mountains. Mon – Japanese castles consist of several gates that are strategically positioned to maximise defense. They are usually made of large, heavy timbers. 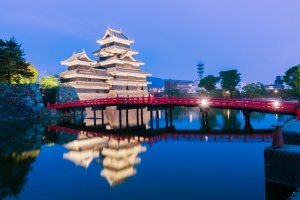 Recognised as one of Japan’s dozen original castles, Matsumoto Castle is a 16th century castle built on a plain in the city of Matsumoto in Nagano. It is best known for its distinct black colour, moat, and vast castle grounds that are home to many sakura trees, a perfect spot for cherry blossom viewing. With a sophisticated white façade, the Himeji Castle is one of the country’s most popular tourist attractions. It was built in 1346 and has been well-preserved through the years. Exploring the castle complex requires a bit of a hike as it covers a large area and consists of many gates and paths going up a hill. Constructed in the 1600s, the Kumamoto Castle is one of Japan’s most impressive and stunning treasures. It has been renovated a number of times after being destroyed and burnt down. Today, its gardens grow hundreds of sakura and other trees, making it a popular cherry blossom and autumn foliage viewing spot. Also classified as an original castle, the Matsuyama Castle was built in the early 1600s and served as the residence of the Matsudaira clan. Its original castle tower, standing five storeys high, was struck by lightning and has been rebuilt to the current three storeys. Finished in 1611, the Matsue Castle is built on top of a hill, with thick stone walls and a moat. Today, not only can people enter the main castle tower for a tour, but they can also get on a small boat for a cruise around the moat.